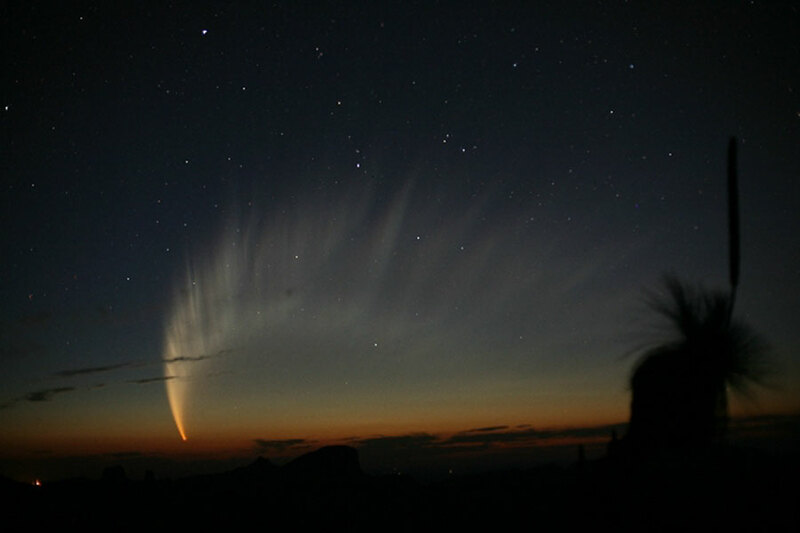 Explanation: Comet McNaught, the Great Comet of 2007, was the brightest comet of the last 40 years. Its spectacular tail spread across the sky and was breathtaking to behold from dark locations for many Southern Hemisphere observers. The head of the comet remained quite bright and was easily visible to even city observers without any optical aide. Part of the spectacular tail was visible just above the horizon after sunset for many northern observers as well. Comet C/2006 P1 (McNaught), which reached an estimated peak brightness of magnitude -6 (minus six), was caught by the comet's discoverer in the above image soon after sunset in 2007 January from Siding Spring Observatory in Australia. The robotic Ulysses spacecraft fortuitously flew through Comet McNaught's tail and found, unexpectedly, that the speed of the solar wind dropped significantly.